If youre like me, an updated version of a beloved audio product brings with it a number of questions. (Its even worse when a favorite musical group releases a new album.) Will it be as good as I hope? Will it maintain the "house" sound of the product I liked enough to purchase? Did the company make a horrible decision that will negatively affect the sound quality I so love? When Sennheiser, a long-time leader in high-end headphones, announced the release of the successor to the tried-and-true HD 600s, it caused quite a stir in the headphone community. Many questioned whether or not these new phones would live up to the well-deserved reputation of the HD 600s. Some even wondered if Sennheiser had made changes to the sonic signature that would repel the many buyers whose loyalty they had earned. For me, these questions, and many more, were answered soon after the $549 USD HD 650s arrived at my door, and by the end of this column youll have some answers yourself. Upon removing the HD 650s from their foam inserts, the first thing that struck me was how little the overall appearance had changed from that of the HD 600s. The four rectangular foam pads in the headband of the HD 600s were replaced with a two-piece design that is thinner, sleeker, and more modern-looking. (I do find that the HD 600's headband is a little more comfortable than that of the HD 650, but I wouldnt go so far as to say that the HD 650 headband is uncomfortable.) The color scheme had changed from a speckled black for the HD 600 to deep gold and gloss black for the HD 650. The design of the Sennheiser HD 650s (and HD 600s) includes three rather ingenious features that merit special mention. The first is the user-replaceable cable. This allows owners to vary the sound of the phones to get the exact sound they seek without the hassle of soldering. 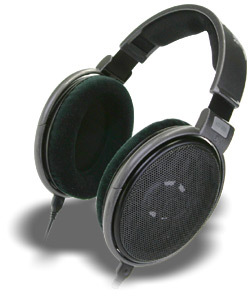 The second feature is the user-replaceable earpads. The foam used in all earpieces eventually flattens out, which will in turn degrade the sound of the headphones. By incorporating easily replaceable pads, Sennheiser ensured that owners would have great sound for years after their purchase. The last feature is an ingenious three-way adjustable ear piece system that allows for greater personalization and comfort. Each earpiece can be rotated about its vertical axis, pivoted along its horizontal axis, and either raised or lowered, all so that the pressure of each earpiece is more evenly spread out, thus reducing, or eliminating, the "clamping effect" some experienced with the HD 600s. Now onto the good stuff -- how the Sennheiser HD 650s sound. Ill start by talking about the bass, as it was one of the first things to stand out. After seeing the frequency-response curve, I expected a lot from the HD 650s, and after hearing them I wasnt let down. The bass of the HD 650s is considerably punchier and deeper than that of the HD 600s. The impact of the music is powerful, even at low volumes, but never overdone or bloated. The bass is consistently taut and controlled, making for some very enjoyable listening sessions. I listened to "Augusträsse 18" from Acoustic Alchemy's Positive Thinking [GRD-9907]. If there were such a thing as a headphone subwoofer, I was using it. The low bass note that occurs at around the five-minute mark came across as tight, deep, and with so much impact that I was awed. Most headphones dont even make the attempt to reproduce this note as it is simply beyond their extension capabilities. Looking at the frequency-response curves for the Sennheiser HD 650 reveals that these phones are -5dB at 20Hz, which is very impressive. The response curve also shows that Sennheiser picked up 6-8dB of bass from roughly 20Hz-50Hz, which provides for a supremely enjoyable experience. Source  eXemplar Audio-modified Denon 2900 universal A/V player. Power cords  Virtual Dynamics Master. Interconnects  Aural Thrills Active Force Pure Palladium. Amplifiers  SinglePower PPX3-6SN7, RudiStor RP5.1. Headphone cable  Stefan AudioArt Equinox. The speed that the Sennheiser HD 650s are capable of reproducing is superb. "Sluggish" and "slow" are not words one could use to describe the music these headphones reproduce. From my tried-and-true test disc, Terry Talbot and Barry McGuires When Dinosaurs Walked the Earth [Sparrow TM-1001], I cued up "Jurassic Pick" and unleashed Terry Talbots guitar-picking fury. This will test a systems speed limit. With the Sennheiser HD 650s, I was hearing a wonderfully lifelike portrayal that left me impressed and eager to listen to the CD over and over again -- which I did. In fact, I listened to the disc ten more times before switching to something new. During the production run of the Sennheiser HD 600s, many users complained about a rather veiled-sounding midrange. When the announcement of the HD 650s was made, online discussion about whether or not the new HD 650s would rid the 'phones of the veiled quality ensued. Im happy to report that the new HD 650s are less veiled than the HD 600s. They are still slightly veiled with the stock cable, as I mentioned in my column on the Stefan AudioArt Equinox HD 600/HD 650 replacement cable. The stock cable is still holding these headphones back from reaching their full potential, but thankfully it is very easy to replace with a cable that will let the HD 650s sound their best. More than any other headphones I have heard, the Sennheiser HD 650s will help you get the most from the investment made in your music system. They will sound good with good equipment, great with great equipment, and incredible with incredible equipment. If you currently own a modest system, dont worry. These phones will still provide you with plenty of listening enjoyment. And as a bonus, when you upgrade an upstream component, theyll reward you with even better sound. Have the questions I had about the Sennheiser HD 650s been answered to my satisfaction? Absolutely. I have a healthy dose of respect for this superb high-end-audio product -- it continues to endear itself to me. After well over 1000 hours spent listening to the HD 650s, it is my pleasure to report that they are very worthy successors to the HD 600s. They are an amazing blend of a detailed presentation, deep and impactful bass, and an enjoyable character that I have not experienced from any other headphones. In fact, the Sennheiser HD 650s were so good that I sold my reference headphones and replaced them with the HD 650s, and I haven't regretted the decision for a second.